AutoFind guidance to potential fault. TDR2000/3P is highly portable, high resolution, compact, dual channel time domain reflectometers with a large colour screen for locating faults on paired metallic cables in applications as diverse as street lighting, telephony and CATV. With a best resolution of 0.1m the TDR2000/3P has a 20km maximum range depending on the velocity factor selected and the cable type. Five output impedances are available (25, 50, 75, 100 and 125 ohms) and with an auto impedance matching feature and a velocity factor between 0.2 and 0.99 to meet any cable test requirements. 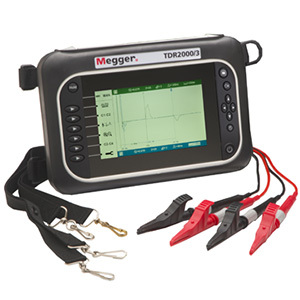 Powered by Li-ion rechargeable batteries, it is available complete with 2 pairs of fused test leads.